In the race of smartphones nowadays every company is trying to come up with bigger and beautiful screens whereas iPhone was lacking behind with their small screen smartphones. A lot of iPhone fans also showed interest towards large screen iPhones for the past few years. According to Bloomberg’s report Apple is currently working on two curved display iPhones and is set to release in the third quarter next year. These new iPhones would have a 4.7 and a 5.5-inch screen and Yes that mean that next year Apple will come up with two new smartphones like they did this year. Till now there were a lot of rumors about Apple’s working on large screen iPhones but today Bloomberg sources confirmed it. It’s not just the new screen, there is a lot going behind it. Apple is not only trying to come up with big screens but also improving the sensors on this new screen. It would be able to know the difference between a light and a heavy touch called pressure sensitive technology. Natalie Kerris spokeswoman of Apple said ‘’Screen size is one of the things where Apple has to catch up to the Android camp”. It’s too early to be sure about anything because Apple just released their iPhone 5s and 5c which are still fresh to the market but Bloomberg’s source has some weight to it and we might see these new smartphones next year. Apple going towards bigger screen makes sense because of the market filled with large screen phones like Note 3 etc. 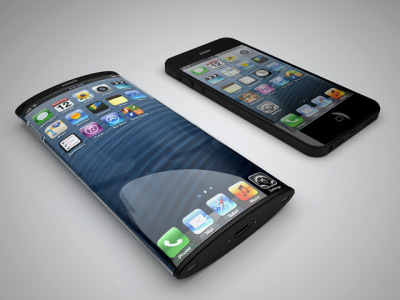 But introducing curved screens might not be such a good idea because we are not sure if iPhone fans would go for it. However every time before releasing a new smartphone to the market Apple always conducts its research and will know how many of their fans are interested in their new smartphone. It is also said that such type of rumors are leaked deliberately to see the reaction of people and it can be a strategic move from Apple to see how the things pan out if they opt for a curved iPhone next year. Well i guess they would surely release large screen iphone models since most of the popualr brands like samsung and sony are already have released their big screen mobiles. I would surely wait for their new launch of new iphones.